From MIT: You Tube matters to Brands! 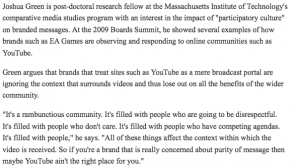 To drive the point of my last post home, I want to show you a few sentences (provided by Boards Magazine) spoken by Joshua Green, from MIT regarding You Tube and Brands. To view his entire speech at the 2009 BOARDS SUMMIT, you can view it HERE. I found what he had to say fascinating, yet simple. Listen up brand stewards. Artists, licensing your music to a brand. DEMAND IT. Make it your creed.